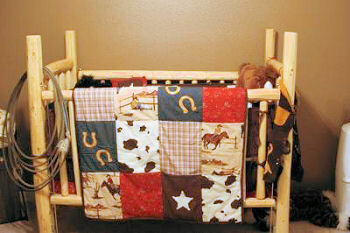 Fans of westerns will love our cowboy baby nursery theme ideas. Memories of sharing of fond memories while sitting around the campfire under a sky filled with stars with a favorite friend or grandparent inspire many to recreate the experience in their child's room. Yet, there are many others that have never been on a horse or visited a ranch that simply desire western nursery decor for the atmosphere. They may never have ridden a horse, had the privilege of visiting a working ranch and may not have a clue as to what goes on there but they feel the pull of the Wild, Wild West nonetheless. 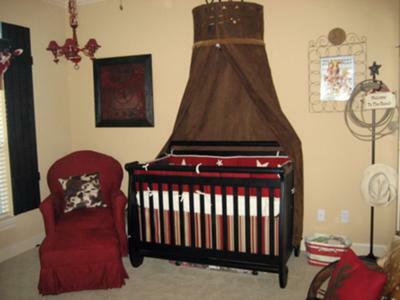 On this page we will present pictures of nurseries decorated in this style shared by visitors to our site. Go here to see the latest items to use in your decorating project. 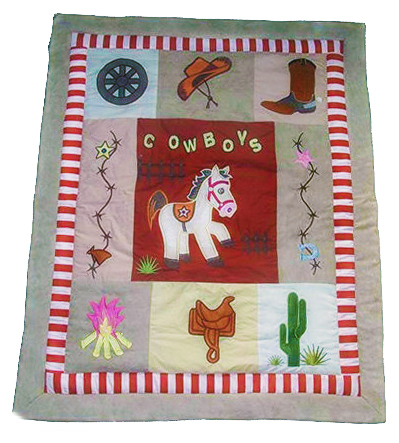 There are some western themed crib sets that are gender neutral that will work just as well for a little cowpoke as a cowgirl. These sets are what make this an exception nursery theme for twins. A copy of the ranch gate from the old homeplace is a dramatic canopy for the baby's crib. Save money with a (baby-safe, of course) homemade crib made of rough pine logs. Vintage cowboy posters, horseshoe drawer pulls, wall hangings and other Cowboy and Indian accessories can quickly transform any room into a scene right out of a Spaghetti Western. 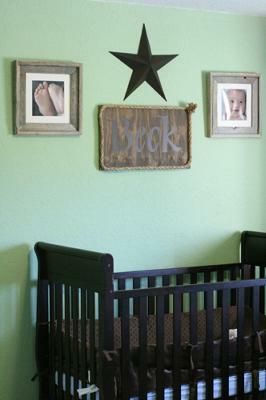 Rustic, wooden picture frames and artwork made of rope and barn board will work with any color scheme in a little Texan's nursery with a "Lone Star State" theme. A soft, neutral shade of green is the perfect complement for the rough wood of the wall decorations. 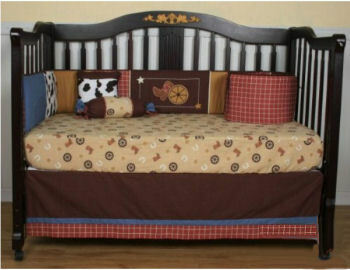 The fabric of the baby bedding set and crib canopy feature a masculine chocolate brown and red color scheme played out in stars and stripes. A homemade bandana valance is a really cute (and very inexpensive) way to decorate the windows. Pink bandanas would work for little cowgirl and as far as a little cowboys window treatments are concerned, the world is your oyster! Colors from bright yellow to classic navy blue or red would be grand so long as they complement your western cowboy baby bedding set. You might combine two or more colors or play with combinations to find the best one for your color scheme. Simple black iron rods and hardware will work but there are cute cowboy boot and hat curtain finials that will dress up a plain wooden rod to perfection. The most authentic cowboy boot lamp that I ever saw was a pair of real leather baby boots mounted on a wooden platform that had been wired and topped off with a lampshade. But you don't have to make your own as there are plenty of cowboy lamps and light fixtures in the home decorating stores. If you already have a lamp and ceiling light fixture or chandelier in place, you can bring them in line with your cowboy baby nursery theme with some stenciling, decals or you might play around with some baby cowboy boots and hats to see how they look decorating the shades of your chandelier. Drag out that vintage leather saddle, some old spurs or a colorful horse blanket and old cowboy pictures and movie posters to decorate the nursery walls. A lasso draped over the top of an armoire or across a cornice board (out of your little baby Buckaroo's reach of course) will give your baby's room a rustic and authentic look. This is the fun part of decorating a cowboy nursery because these decorations are what set your nursery design apart from all others. Take a plain old baby dresser and dress it up with some tin star pulls or you might even make your own out of horseshoes! So what if your wooden furniture is distressed or beat up; that's the authentic bunkhouse look that we are shooting for. 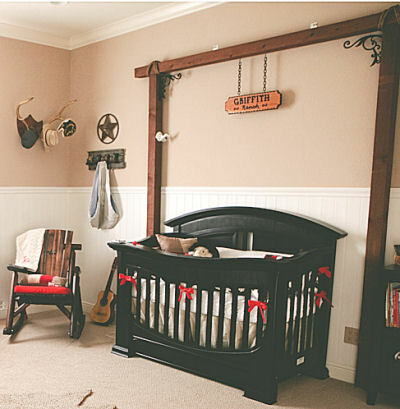 Here are some more tips to put you on your way towards decorating your cowboy baby nursery theme. I hope that you found something that you can use in the examples of cowboy nurseries and decorating projects and when your own project is completed and you are done decorating your little cowpoke's room, I hope that you will mosey on back to Unique Baby Gear Ideas to keep up with the latest in nursery decorating trends and that you will share some of the pictures of your own little cowpoke's room.